Buying a convertible is a dream for many people. Convertible cars are almost always sporty and fast, meaning that purchasing a convertible is all about purchasing a vehicle for fun – not carrying the kids to soccer practice of helping your friends move house. A convertible is about freedom, care-free driving, the thrill of hearing the engine rev and having the wind in our hair. 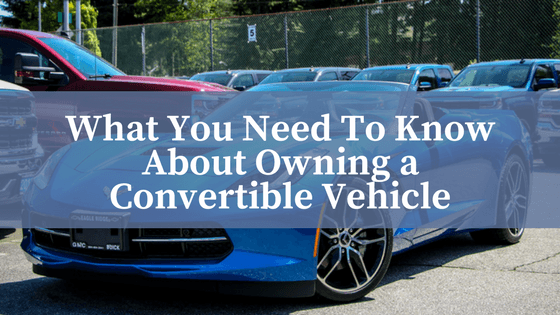 So what do you need to know prior to purchasing your first convertible? In this post, we’ll present a few tips and tricks and compare some differences to consider when purchasing a new convertible. We suspect they won’t deter you one bit – but convertibles aren’t like most cars, they deserve their very own sensibilities and best practices. To this same affect, your neighbour’s motorcycle, or boat, or snowmobile are typically regarded a seasonal ride. A convertible has its obvious benefits during the peaks of nice weather for you to enjoy! So do yourself a favour and use it when you’re sure to enjoy it. Factor in these considerations when choosing a hard top vs. fabric top style convertible. Each has their visual look and functionality to consider. The main difference between a convertible and a hardtop is, you guessed it – the roof. Sometimes a higher end convertible will feature a hard convertible top that features the same finish as the rest of your car. With these automatically reclining tops, the best way to maintain the inner workings of the mechanics is to have them serviced once per season to lubricate and tighten up any loose aspects of the system. This can typically done through your certified dealership maintenance. With a soft-top, on the other hand, maintenance is a different story. The longevity, performance and visual aesthetic of a fabric or vinyl top is a thing of automotive beauty. Cleaning it is of the utmost importance to maintain its workability, function, and looks. A simple hand wash with basic car detergent soap could spell premature deterioration of the material which could lead to a leaky roof, or worse – an unappealing look. First, determine whether you have a fabric or vinyl top. You can test for this by trying to rub a half teaspoon of water into the material – if it’s easily absorbed, you likely have a fabric top. Vinyl will simply hold the water on top. Household cleaning products aren’t the best things for your convertible top. Instead, opt for specialized cleaning products to clean and maintain your top – like fabric convertible top protectants and UV protectant sprays that protect from the elements. Convertible fabric tops can also attract dirt, lint and pollen quite easily. You can carry a lint brush or a soft bristle brush to give it a clean on-the-go. Your brand new convertible is a thing of beauty, and you’ll want to take extra care to ensure it’s looking good as new. Convertibles are open top vehicles, so there’s a stigma that they’re easier for thieves to steal. Not so. Each make and model of convertible comes with standard security features you’d expect in addition to having the roof of the vehicles engineered for these instances in mind. Most convertibles have fold-away roofs for weather and for theft purposes. Simply put the roof up and lock the doors and you’re left with a car that’s much the same as any other vehicle. Naturally the most important difference about a convertible is remembering to take extra care to secure your belongings and put the top up when parking in unfamiliar places. With the top up, you can lock your car just like any other. With all these things in mind, you’re ready to hit the road and take advantage of the beautiful weather during the warmer seasons! At the end of the day, the most important thing you need to know about owning a new convertible is the thrill of the ride on the open road with the wind in your hair.